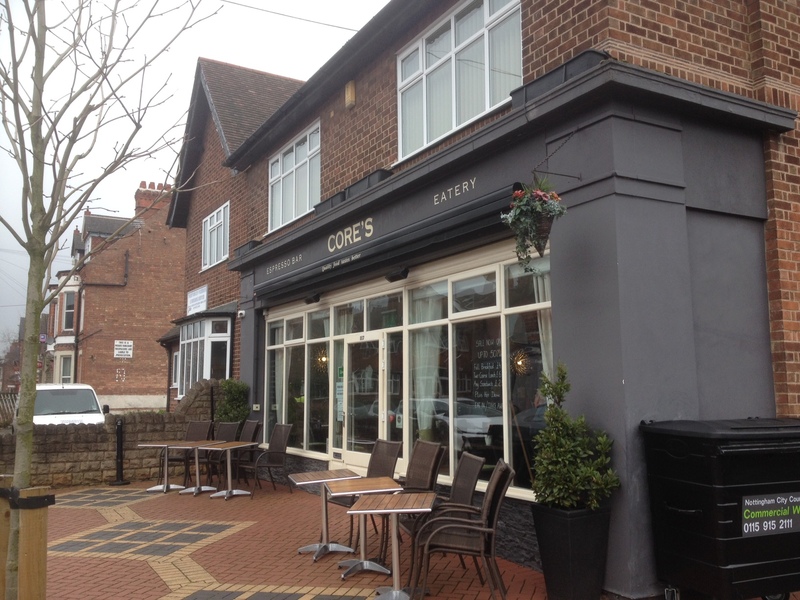 Core’s Bistro in Lady Bay was quite an excellent find and I have been in a couple of times now. According to their website the name is an acronym for ‘Community, Opportunity, Resources, and Expertise’. The Bistro is a partnership I understand between Maria Spalek (the owner) and Joanna Prusaczyk (Read more of the story on their website here). My first thoughts were that I like that everyone seems to know everyone else, and it was as much a meeting up point, as a café and as such it had a real community feel. 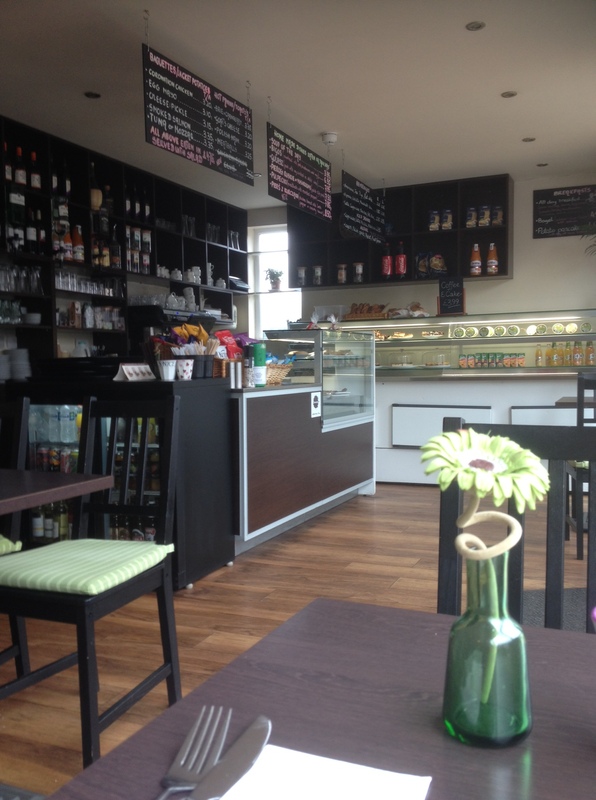 I also like that they have a menu that is a little bit different to many of the cafés in West Bridgford and its periphery (can I call Lady Bay as part of West Bridgford? – maybe not). I also like that they have a Polish menu. I must say that initially it was the promise of that Polish menu that had brought me over to Lady Bay to seek them out and it was Pierogi that I was on the hunt for. Once inside I was instantly delighted to see the black board above the counter with a list of polish dishes chalked up upon it. I could have been distracted by the “All Day Breakfast” which was ‘Polish sausage, bacon, egg, toast, tomato, beans, and mushrooms‘ for £4.95 (reduced on the chalkboard) or a ‘Potato Pancake with egg or sour cream‘ for £4.50, but I wasn’t. I could if I had so chosen had a Baguette or Jacket Potato filled with Coronation Chicken for £3.2o or with Smoked Salmon for £3.35, I resisted. I wasn’t even tempted by a Hot Panini or Toastie with Meatballs, or Polish Ham, or Brie and Cranberry for around £3.20-3.30, but again no, I came here for something Polish. It didn’t stop me looking though. I do have a distinct fondness for Pierogi, but I also have weakness for meatballs and so it came to pass, that on this first visit, I found myself sitting in front of a plate of Polish Meatballs or as they called them “Pulpeciki z Grylowana Papryka“. This was in fact a plate of ‘Pork meatballs with roasted pepper topped with cheese‘ that came with some sort of pasta that looked like chopped up spaghetti. 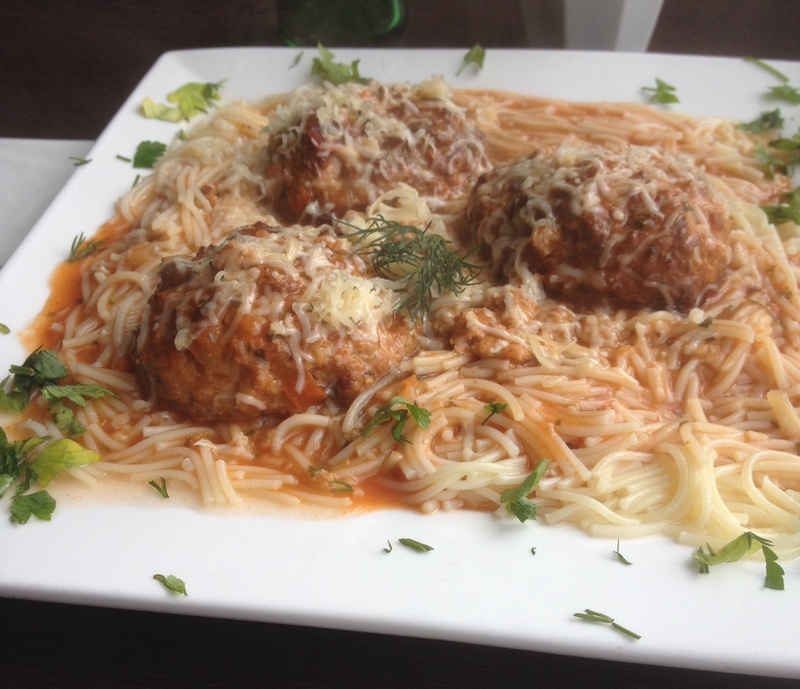 The meatballs were bigger and softer than I expected, they were quite good though, after all they are meatballs. I wasn’t too sure about the pasta part of the plate, but you know I was happy to go along with the flow. Good meatballs is all that I really cared about and they are good enough to return for, BUT I was sad that I didn’t have Pierogi and thought about them all the way back to the office. This week I had to come back to try the Pierogi and to be honest I had been thinking about it since my last visit a week ago. So for this visit I knew what I was going to order. There were two choices of Pierogi on the board; ‘Pierogi Ruskie’, and ‘Pierogi z Kapusta i Grzybami’ and if you don’t read Polish, it did say helpfully that the second option was filled with mushroom. I had my suspicions based on some time grazing through many plates of Pierogi alongside friends in the Polish-American community in Philidelphia and Chicago that the first one, the Ruskie, was going to be filled with potato and cheese, and my suspicions were correct. I ordered a plate of the Pierogi Ruskie, and it was a neat and tidy dish, if not quite what I was expecting. In the past the pierogi I have eaten have always been more, well how I can I describe? a sort of silky dumpling cooked in butter and filled with all sorts of tasty fillings. 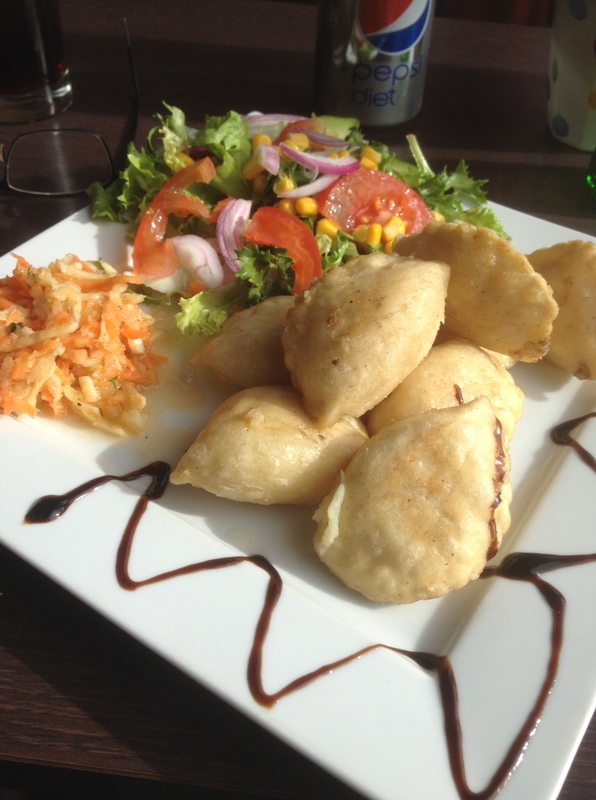 On this occasion the pierogi had been lightly fried so that they were more of a crispy parcel, don’t get me wrong they were nice and the filling was tasty, but not quite what I had expected. The accompanying salad was decent and I really liked the coleslaw type side that came with them. There was also a drizzle of balsamic along the rim of the plate which was needed as after about half of the pierogi pieces I needed something sauce like to cut through the dish, perhaps a little cream, perhaps a little tang of some sort, or some butter I think that was what I craved. After I had finished I had a nice chat with them and asked about the style of Pierogi cooking and it turned out that I could have had it with butter, and after I got home I saw the menu on the website which described the dish as “Polish pasta stuffed with milky white cheese, potato and onions topped with country butter or bacon”. Yes please that was what I would like, only with both ‘country butter AND bacon’. Next time I am in here I am going to see if I can get it like that as it brings back such warm comforting memories and well lets face it I am not ashamed to admit, it is a pure comfort food craving that borders on a mild fetish for any food of the ‘dumpling’ variety. I like Core’s and will probably be back for those butter covered pierogi and maybe a little bit more of that community feel.